Toyota says the Mirai's range is 312 miles between fueling stops. Toyota Motor Corp. said last week that its hydrogen-powered Mirai has a range of 312 miles between fueling stops, the most of any emissions-free car on the market, though finding a location for a fueling stop will be a challenge. The Mirai, slated to go on sale this fall in California at a base price of $58,325, including shipping but before incentives, generates electricity by sending hydrogen gas through an electrochemical fuel cell. An electric motor powers the car. It will get an estimated rating of 67 mpg equivalent on the EPA test cycle, Toyota also said last week, better than any gasoline-fueled car on sale in the United States, including Toyota's Prius hybrid. 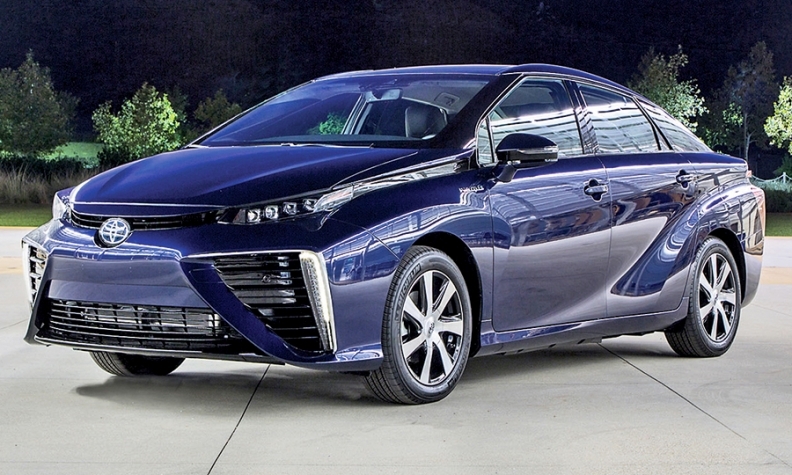 Toyota plans to sell about 3,000 units of the Mirai by the end of 2017. And for times when a 312-mile range is not enough, the company will offer Mirai owners a complimentary rental car for seven days a year for three years. "Just as the Prius introduced hybrid-electric vehicles to millions of customers," said Jim Lentz, CEO of Toyota North America, the Mirai will "usher in a new era of efficient hydrogen transportation." However, only a dozen hydrogen stations are open to the public nationwide, according to a U.S. Department of Energy database. To help the infrastructure along, Toyota granted a $7.3 million loan to startup FirstElement Fuel Inc. last year to build 19 hydrogen stations in California.